Life Lenses: Swedish Cinnamon Buns (Kanelbullen). 'Kanelbullensdag' (or Cinnamon Bun Day) in Sweden is on the 4th of October, so I am a little late (or early?) with this one. But I have been meaning to make these little guys for ages and today seemed as good a day as any to do it. 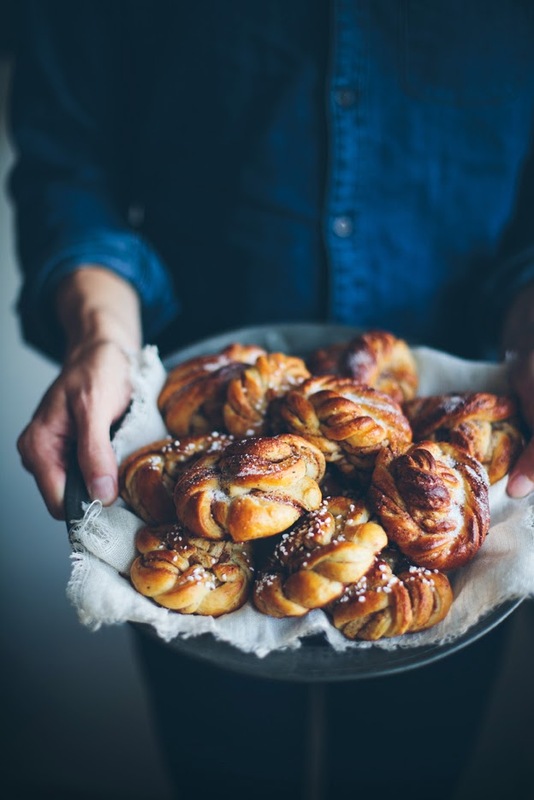 Especially as episodes 3 and 4 of Danish/Swedish drama 'The Bridge' air on British TV tonight, so these buns would be a fitting snack to watch it with. Firstly, I wanted to say that my inspiration for this post comes from the beautiful blog Call Me Cupcake and I can only wish to have as beautiful photography as her. (Plus she is just generally really cool). 2. Heat milk in a saucepan until approximately 37°C (so kindof hand-hot), remove from heat and add sprinkled yeast. Stir until dissolved. When yeast is completely dissolved, add milk to butter mixture. 3. Gradually add the flour, then work until dough is smooth and elastic. Cover bowl with a cloth and leave to rise until doubled in size, about 45-60 minutes. 5. When dough is ready, roll it out into a large rectangle. Spread the filling on top (a knife is easier than a spoon). 6. To make the shape pictured here, fold the dough two times (so you have three layers of dough, kind of like a business letter!). 8. Twist together into a knot and put on parchment/grease-proof paper. 9. Repeat until you have finished knotting the strips. 11. Heat oven to 250°C (or a bit less if you have a fan oven). Brush with beaten egg. Sprinkle icing sugar and chopped almonds on top if desired. Bake for about 8-11 minutes, depending on the size of the buns. (Good with coffee or milk. But I suspect tonight we will be munching them with tea). -Instead of Ground Cardamom (couldn't find this in the shops) I just bashed up a load of cardamom pods and removed the shells. mmm! must be very yummy! Thanks for the recipe! I'm a big fan of cinnamon buns, but have never tried the Swedish version. Will have to try it and let you know how it goes!